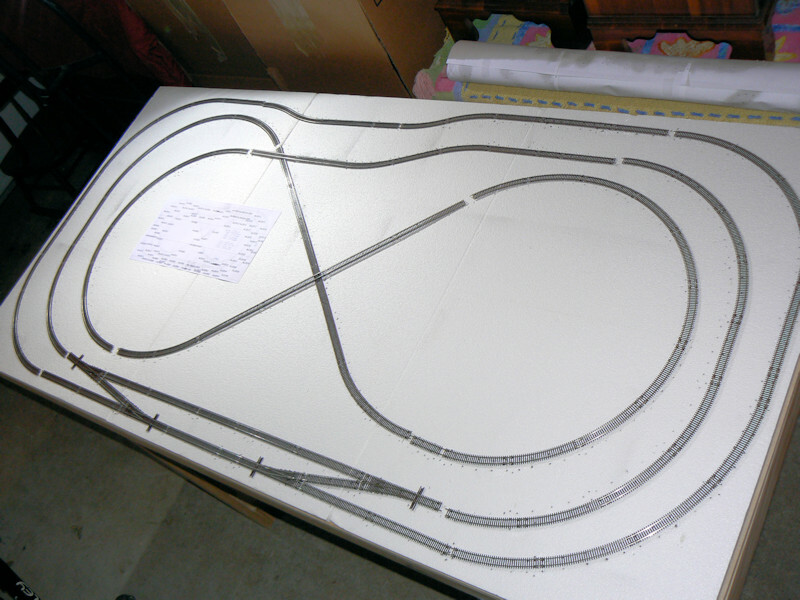 Hello and welcome to part 2 of a series of articles about N scale model train building.This article shows the layout and basing of the N scale track.The previous article discusses how I build a table formy 3 by 6 foot (0.9 by 1.9 m) layout. 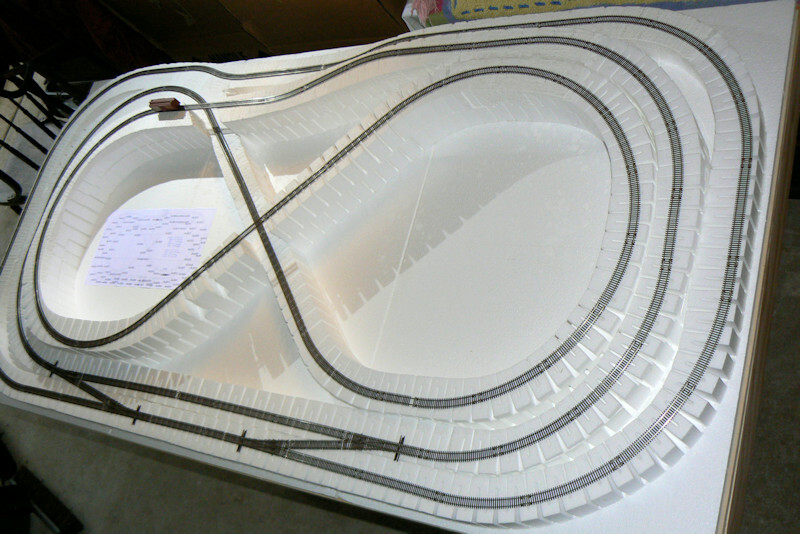 I based my track layout design on theWoodland Scenics Scenic Ridge layout.However, I tend to like continuous "roundy round" train operations, so I got rid of thesiding and added an extra loop.Full instructions for Scenic Ridge are availablefrom Woodland Scenics. The first photo show transfering the track pattern to the table top.As a first step the wooden table top has been covered with thin sheet of styrofoam.The Woodland Scenics kit came with this 1/2" (1 cm) thick sheet.Then I printed out the track design to paper with about a 400 to 500 percent magnification.Hopefully your printer driver has a option like this.Tape the pattern to the table top and puncture holes in the pattern with an awl or a smallscrewdriver.I then sprayed black paint on the pattern to tranfer the puncture dots to the table top. This photo shows test fitting the track on the table top.I decided to go with Atlas Code 55 track instead of the more common Code 80 track.The code number is a measure of the height of the model track rails.Code 55 is shorter, but closer to proper scale of an actual rail road.Code 80 is taller and less to scale, but it also is less susceptible to dirtand grit problems and in general is friendlier to running trains. As you see I put a little jog on the back wall of the outer loop.I wanted to make sure that anyone looking into the tunnel would not see where thetunnel headed.It turns out the tunnels are so dark that I really did not need this little detail. The ramps come in 1 and 2 degree slopes so the ascent and descent of the model trains is niceand even.The risers come in a few different heights, but notice that you can stack the risers to getthe track really high in the air. Styrofoam is fun to work with. You can easily cut it with a hot wire tool (which makesa nice neat cut in the foam) or long razor knife (which can cause some foam flakes depending onhow sharp your knife is). 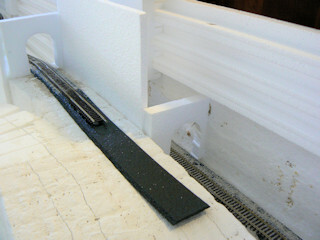 This photo shows the "profile board" installed on the back side of the layout.The idea of the profile is to make a nice abrupt end on the edge of the layout.In case the profile will show a mountain ridge. Make it as high or as jaggedas you like. 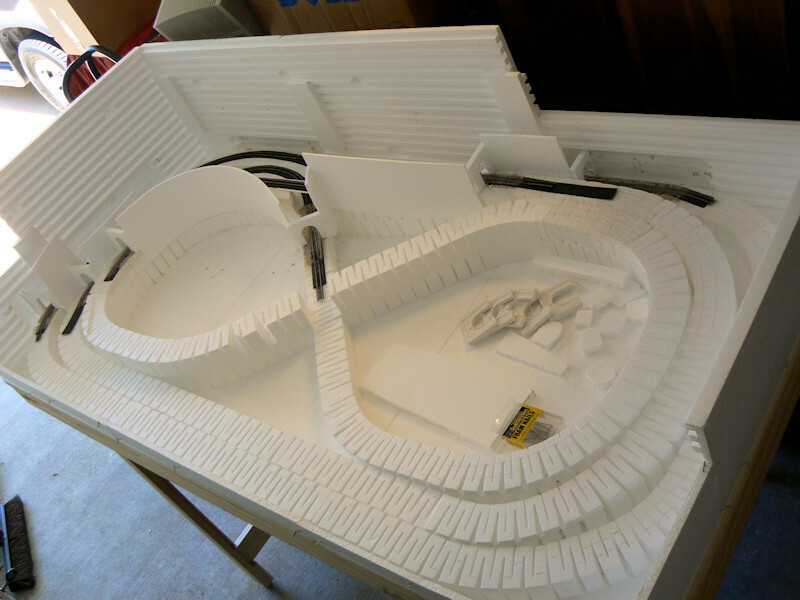 Also notice some walls for a tunnel have been glued into place.I enjoy the tunnels on this layout, and I think it is one of the fascinating featuresof model train layouts.You see a train enter the mountain. It disappears. You wonder where it went.Some time later a speeding train emerges from another opening.How did it get there? 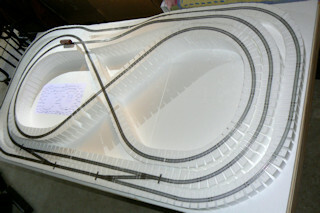 Was there any trouble along the way?This layout has three tunnels through the mountain. Loads of fun. Here comes my biggest gripe with the Woodland Scenics "Scenic Ridge" kit - theinstructions.Big frustration number 1: the Woodland Scenics instructions ask that you disassemble the track keeping onlykeep the tunnel track in place while you go and work on scenery.Yah right!I found it a royal pain to reassemble the track at a later time and try to get it all tofit together the same way.Sometimes I had to purchase additional track sections, as one of the sections which fitso nicely now needs a slightly longer or shorter piece.It never seems to go together the same way twice! 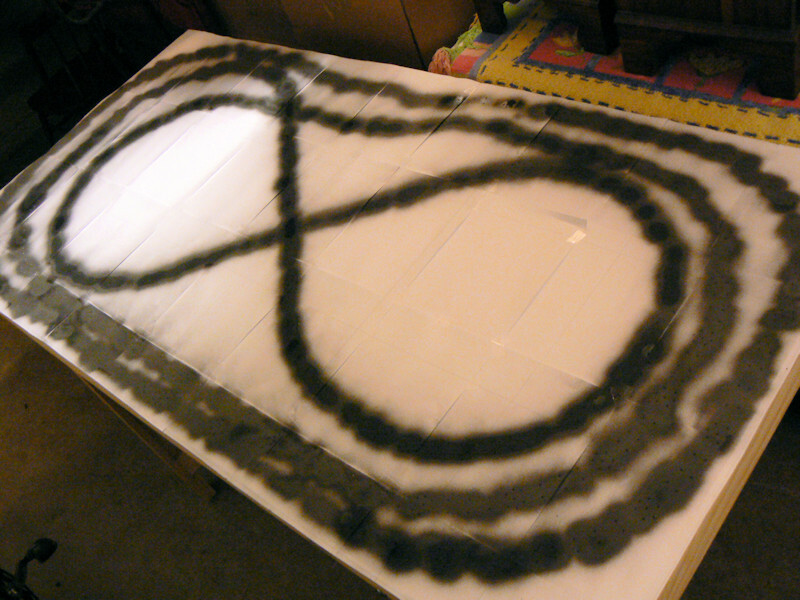 My recommendation is to layout the track, glue in the foam bed, and glue down the track allat once.Cover it with masking tape if you are working on some messy scenery, but definitelyget it down all at once and fix it into place all at once. 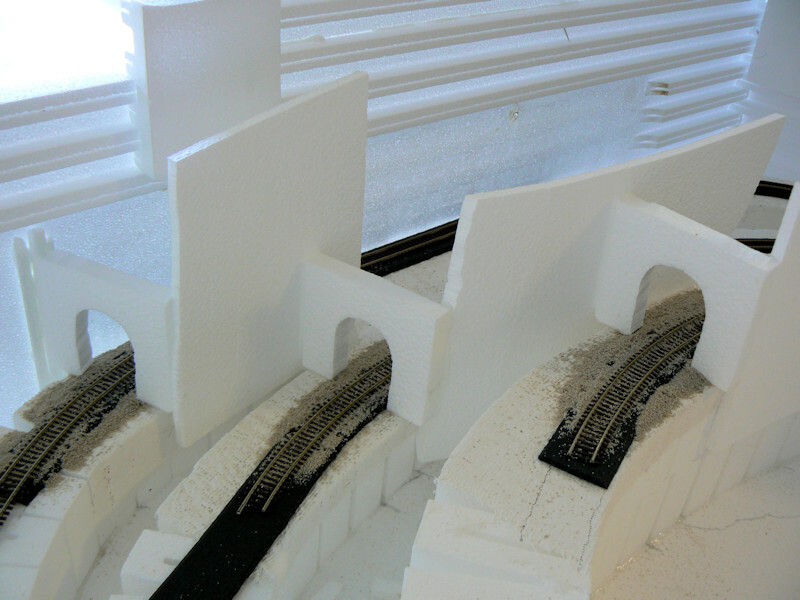 This photo shows the triple tunnels at the other end of the layout.The foam arches will be the backing for the nice plaster stone portal castingsthat Woodland Scenics makes. Here comes my big frustration number 2 with this layout.That gray sand you see on the track is called ballast.It simulates the rocks on a real rail road track that allow the water to drainaway while providing a nice solid base for the ties and the rails.The Woodland Scenics instructions tell you to pour the sand into place.I had to use a whole lot of it to get the sand to cover the black foam track bed.Then the instructions tell you to use the misting spray bottle (supplied with the kit)fix the ballast into place with some dilute white glue.They call it scenic cement.However, my misting skills must be lacking, because as you can seeI blasted the sand all over the place exposing the white and black foam.Perhaps I should have painted the bed so I could use less ballast.Finally, getting that dilute glue all over the rails is no fun to clean up.I spent many many hours cleaning the track and getting the trains to run. I found a better alternative for the ballast was to use an eye dropperor a nalgene squeezy bottle to squirt the glue into place.The squeezy bottle lets you carefully control the water pressure and thewater placement.After laying the dry ballast, I squirt some water and isopropyl alcohol (about 2:1 ratio)into the ballast.The alcohol breaks the water surface tension and allows it to be easily absorbed into the ballast.Once the ballast is wet, I do a second pass with a second squeezy bottlewith white glue, water, and just a tiny bit of alcohol.The glue gets sucked down into the wet ballast and forms a rock solid mass when dry. Last modified: Thursday, 09-Jun-2011 13:08:19 MST.